Most of the time ellu sadam is prepared at home in smaller quantity to offer god and that is considered as only "Prasadam". Last week, one of my cousins came and stayed with us. He asked only variety / mixed rice for his lunch box. 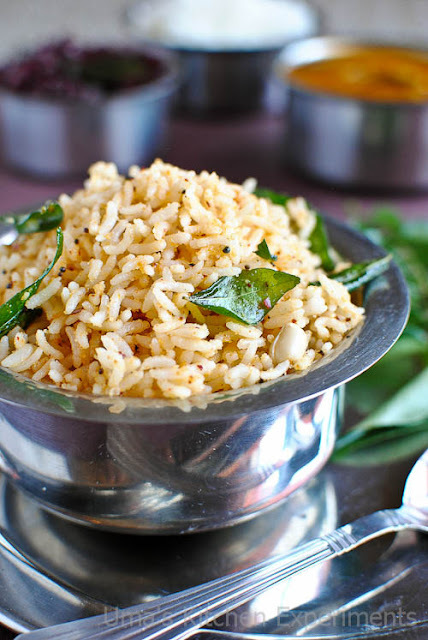 As he starts early in the morning to work, I prepared very quick mixed rices like this ellu sadam. Also, I didn't have this recipe in my blog. So, I prepared it again today. 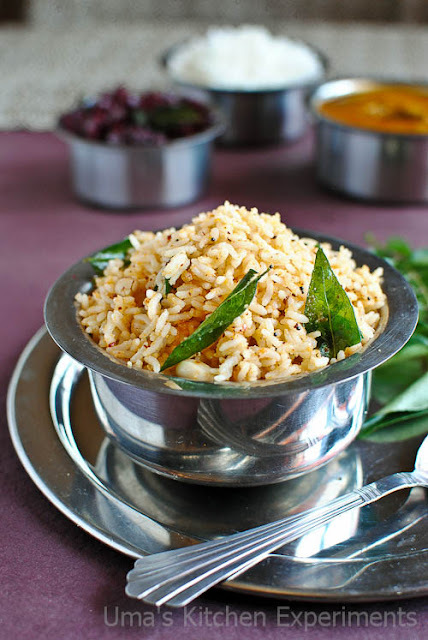 We can prepare this ellu podi in advance and whenever required, we can simply mix it with rice and add seasoning. Also, you can use black or white or both sesame seeds for preparing this rice. 1) In a kadai / frying pan, dry roast dry red chilli and urad dal. 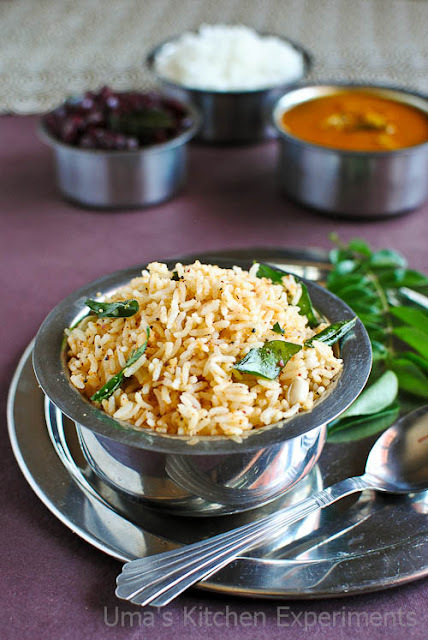 Transfer to a plate, when urad dal turn slightly brown and releases nice aroma. 2) In the same pan, add sesame seeds and dry roast till it changes in its color and releases nice aroma. Turn the flame off and transfer it to a plate to cool to room temperature. 3) In a mixer/coffee grinder, take urad dal and dry red chillies. Grind it to a powder. 4) Then, add the sesame seeds and grind it just for 10 seconds or just give one or two pulse. Keep this powder aside. 5) Heat the same pan and add gingelly oil. 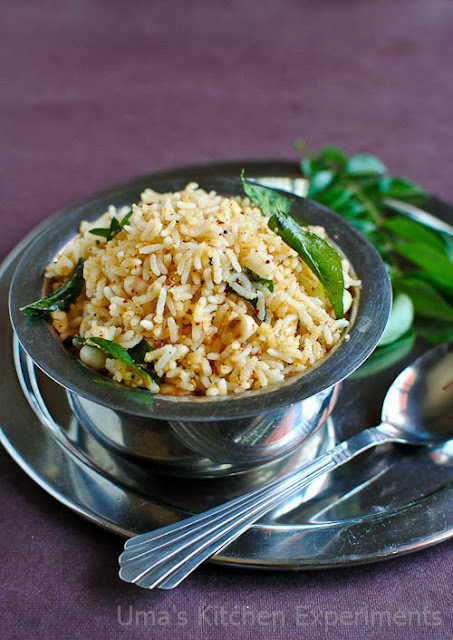 6) Add mustard seeds, curry leaves, peanuts and asafoetida when it is hot, fry for few seconds. 7) Turn the flame to low and add cooked rice followed by salt and sesame powder. 8) Mix well without breaking rice. Taste and adjust the salt. 9) Continue mixing till the rice heats up well. 10) Serve with fried papadams. 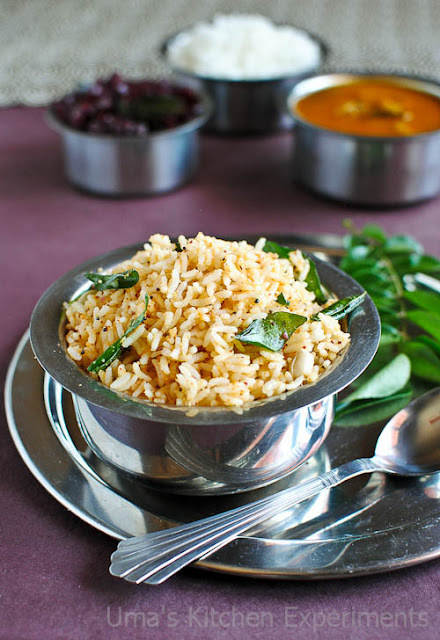 1) For each cup of cooked rice, add a tablespoon of sesame seeds for making this rice. 2) Adjust the dry red chillies as per your taste. When i was a kid, i used to go to a near by temple only to get Prasadam & weekly once it used to be ellu sadam!! Nostalgic! nice aroma of ellu.. love it as temple prasadham..
Can imagine the flavor,yummy rice. This dish is new to me , but sounds great...will try it sometime!! Feel like inviting myself to ur place, loveeeeeee this sesame rice. delicious rice preperation.i will try.